My mother died six years ago today. She was 90 years old. She lived a good, long, mostly happy life. Not that there weren't regrets, and disappointments, and sadness--but also, there was love, and good fortune. I've written about her before, and as I was thinking about what to write today to mark another year without her, I keep coming back to all the things that have happened in the past six years that she will never know about. My sons have grown into men, and she would be so proud of them. Loren and Connor were fortunate to have spent a great deal of time with their grandmother, to have a real relationship with her, to love her, and to know that she loved them, as she would say, "from before the beginning 'til after the end." Our country, and the world, have changed in profound and mostly unhappy ways, and to be honest I am often extremely relieved that neither my mother, nor my father, are alive to see some of these changes, which would have mystified and upset them deeply. Sometimes, what hurts me the most is that my mother has no idea the direction my life has taken since she died. She doesn't know that in the past six years, I have pursued my passion for art, fiber art in particular, that I have gained worldwide exposure for my work, and even achieved some bit of success as an artist and artisan. She doesn't know that she, in large part, is the reason I have reached for and achieved any of this. While she was still alive, I knit and made temari as pastimes, in spare moments between taking care of my family and working at my job as a freelance editor. It was only after she died that I realized, in part because she had never pursued her own artistic career, that I had to pursue mine. My mother attended the Art Institute of Chicago in the 1940s, worked as a commercial illustrator, and took a job at the Metropolitan Museum of Art when she moved to New York City after World War II. 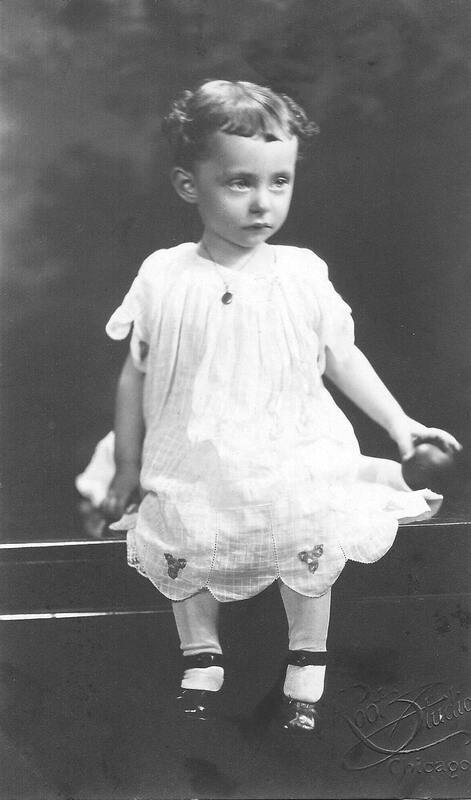 But, being a woman of her times, she abandoned her career when she married my father in 1949, putting her energy instead into raising my older sister and me. 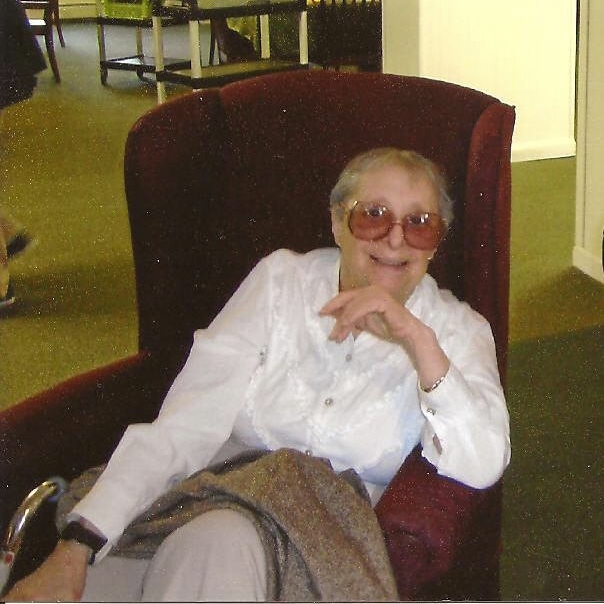 But she remained creative, in her way: she was an excellent cook, dressed with her own personal flair, and pursued art as a hobby, frequently taking classes at the Brookfield Craft Center. 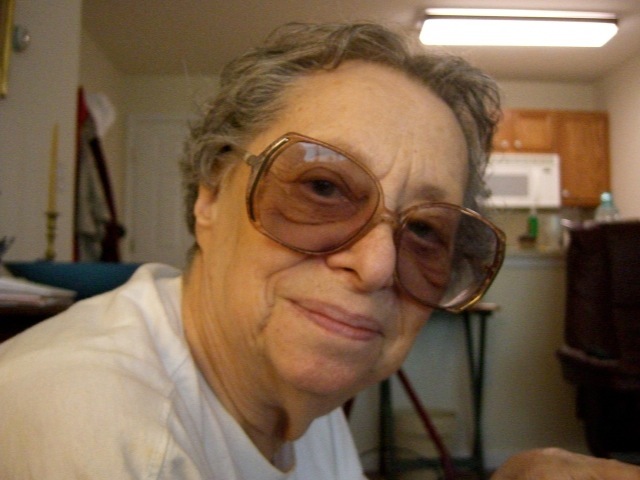 At one time she had a good-sized loom set up in our upstairs hall; and she loved to make small collages, and cut-paper designs, and Valentines. 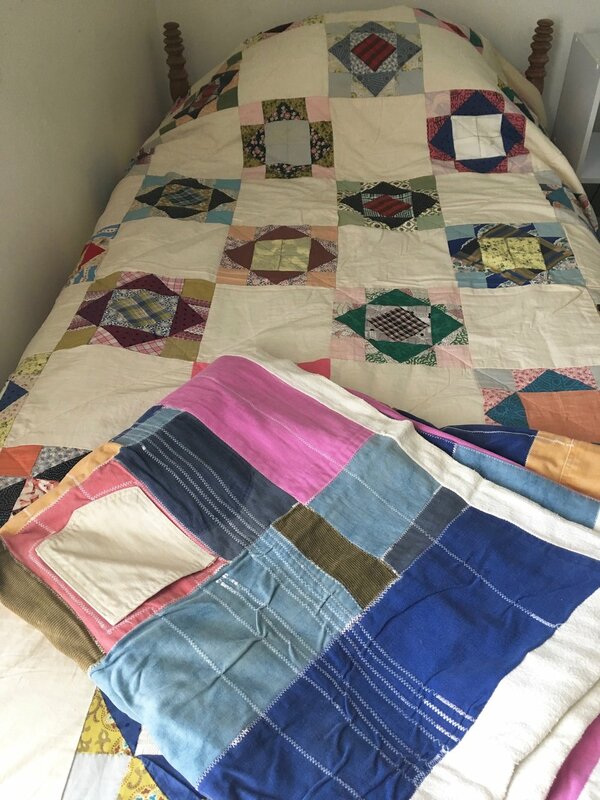 Not especially a stitcher, she nevertheless made two hand-pieced quilt tops, and improvised a quilt made from the colorful pants I wore in high school. She tried her hand at needlepoint, bargello, embroidery, even a little knitting. When my sister and I cleared out her apartment after she died, we found stacks of notebooks filled with calligraphy, drawers and shelves and boxes of art supplies, her sketchbooks from her days at the Art Institute. 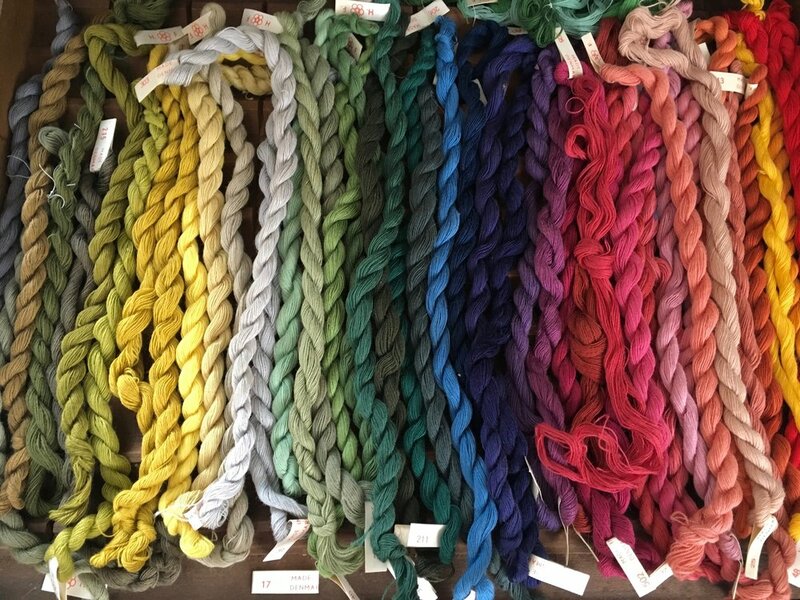 I inherited from my mother my love of color (though she preferred orange and yellow and I tend toward blue and purple) and texture, and several boxes of threads, yarns, and fabric scraps. My father, Alvin Tresselt, was a well-known children's book author. Many years ago, with several as-yet-unwritten books under contract, my mother was urging him to get to work on the manuscripts. My father, alas, could only write when the Muses visited him and whispered the words into his ear as he typed; exasperated, he snapped, "Well, if you think it's so easy, why don't YOU write a book!" And so my mother, task-oriented as well as creative, sat down at her typewriter and did just that: "A Kiss Is Round," her first book, was published in 1954. Over the next 20 or so years, she wrote six more books. Just last year, Oxford University's Bodleian Library Publishing brought out new editions of two of her books: "What Is Round" (the updated title for "A Kiss Is Round") and "N is for Nursery." It breaks my heart that she doesn't know about this, either. She would have been so tickled! My home is filled with mementos of her: photographs, of course, but also a small, square box of tiny colored pencils, old Valentines, whimsical toys, various assorted "objets", and her collection of hand-made kaleidoscopes--perhaps another passion I inherited from her. I guess it's clear, from what I've written, that I miss her. Our relationship, extremely close as it was, wasn't always easy, or simple. But she is indelibly, always, part of me, and part of the art that I make.